Clash Royale is currently one of the hottest games on the mobile platform right now. Combining all the best elements of tower defense, card collecting, and strategy, the game proves that Supercell is a powerhouse publisher that’s right at the forefront of game innovation. One of the key tactics in Clash Royale is being able to know and formulate what kind of deck you would like to play with for its various game modes. Keeping track of your decks can be a tedious prospect, though, because Clash Royale limits this. 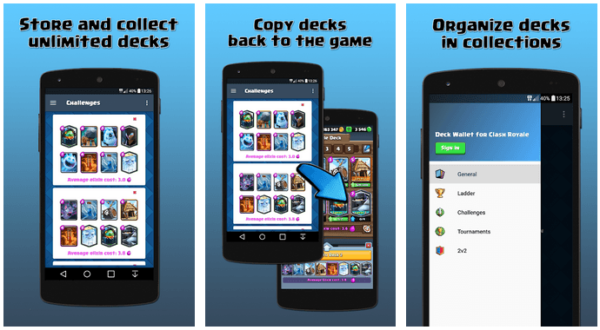 It’s for this reason that developer Txedo set out to create the Deck Wallet for Clash Royale — a simple yet noble solution that allows you to organize your decks and share them on the app itself. We talked to Txedo about the design process he had with Deck Wallet, the multitude of tools he used, and a bit about the special person in his life who tied it all together for him. (1) Could you tell us about yourself (your name/nickname, hometown, age, occupation, favorite games that you play and what platform(s) you play on)? My name is Txedo and I am from Spain. I am a software engineer and currently work at a fintech (financial technology) company. Both to keep fresh on technologies due to my professional career and as a hobby, I develop personal side projects. The brand I publish them under is Bloodeye Games. Bloodeye Games is a brand I founded myself and I cover all positions here from customer support to development, social media, and everything. But it couldn’t be possible without the help of my girlfriend since she helps me a lot to keep designs and interfaces simple enough. (3) What inspired you to create an app for this game? How does it feel to create something original for this game? I started to play Clash Royale almost two years ago. In the beginning, players could have only 3 decks at once in-game, and then the limit got increased to 5. When you play different game modes and like to test decks that limit is ridiculous, so I made screenshots of every deck I liked. Soon my devices got filled with deck screenshots and I started to organize them in folders or albums, but it was tedious to remake a deck in-game from the screenshot by changing gallery and game windows back and forth. Last year, Supercell implemented a deck sharing feature, and I thought that it would be nice if I could benefit from that feature to share decks to an app and store them with no limit, then copy them back to the game. So I developed Deck Wallet for my own use and then decided to publish it on Play Store so anyone in the world could use my own solution. (4) What programming language or tool did you use to create this app? Do you have any favorite PLs or tools? Deck Wallet is programmed on Java using Android Studio. User accounts and decks are stored on the cloud using Firebase from Google. To organize myself and my work I use a kanban board on Trello, and I the code is hosted on a git repository at Bitbucket. (5) When it comes to designing the user experience/UX/interface of the app, what motivated you or what influences did you have? The app interface is designed close to the real Clash Royale game. I used the same fonts, colors, layouts, and graphics, so the user experience between both apps is similar and he is able to recognize elements fast. For example, the average elixir cost of a deck is expressed in the same layout and color as the game use to do. I think the app is quite useful since it lets you save and organize unlimited decks and copy them to the game easily and fast. Now you can even build decks in Deck Wallet and it supports offline mode, so you can build your decks even with no internet connection and copy them later to the game. Deck Wallet also offers an Explore section to find new decks from other users and there are many new features coming in the next updates. (7) Are there any errors when it comes to the app’s performance and provided information? Deck Wallet is quite stable currently. It has more than 20k downloads and 200 daily active users. From that, 99.5% are crash-free users. 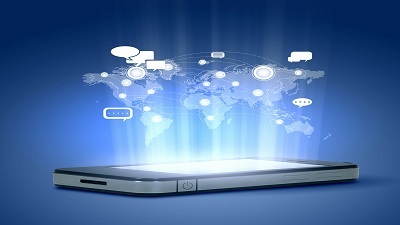 We also designed the app to be optimal in terms of internet data usage and memory consumption. Since Deck Wallet is a personal side project, the biggest challenge is to find free time to develop an idea. Another great challenge for a developer is to design resources and to keep interfaces simple. The former was overcome by watching some Photoshop tutorials and the latter was only possible thanks to my girlfriend. (9) Are you expecting the game’s updates to change your app’s dynamics and performance? Is it something that you’ve already prepared for? As I am an active player I am fresh on all game updates and I do my best to keep Deck Wallet aligned. For example, when the game releases a new card I publish the app update with that card in a few hours. I also add new collections when the game adds new game modes. The only thing that could make Deck Wallet useless would be that the game allows players to have unlimited battle decks, and that won’t happen. (10) Are there any exciting new developments for your app? Do you plan to create more apps like these for other games in the future? Of course, I have many ideas for it. 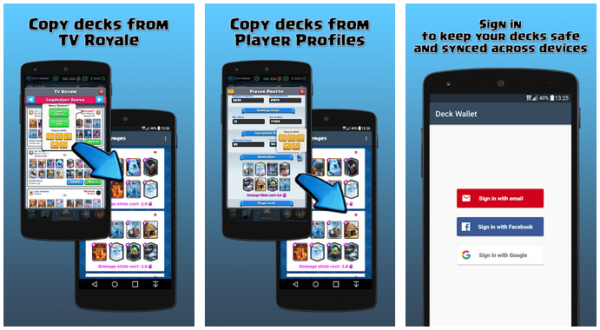 For example, our users are requesting us to be able to add names to decks and we will implement it. We will also implement a feature to let users mark with a star or a heart their favorite decks. We are also willing to implement integration to royaleapi.com to suggest the best decks. Enjoy the game and think of new strategies, they are unlimited! Watch clips on YouTube and streams on Twitch to learn from the best players. If you have an idea, do it and publish it as fast as you can. Your first version is a proof of concept and may have tons of errors, but you can improve and fix it later. Check out and download Txedo’s fantastic Deck Wallet for Clash Royale today. We publish inspiring developer stories on our blog, as well as updates for the most awesome games and reviews on the coolest gaming gear.